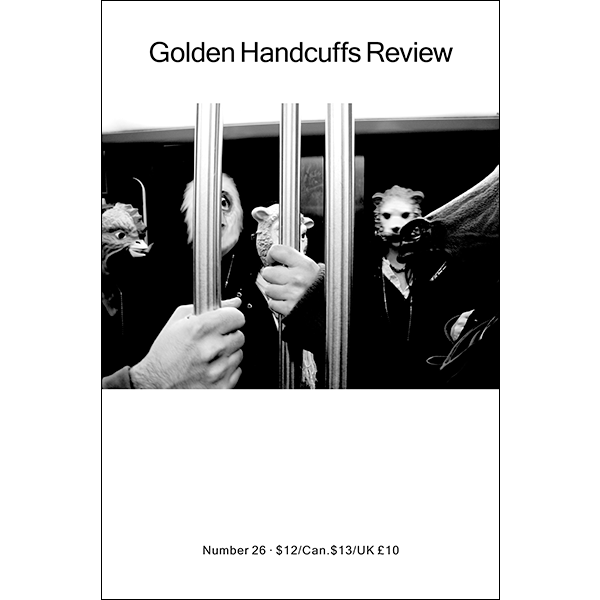 NEW Golden Handcuffs Review #26 interactive .pdf download from 2019! This issue features cover art by Andrea Augé. Poetry and prose by Lori Baker, Joanna Ruocco, Marream Krollos, Richard Makin, Alice Notley, Denise Riley, Robert Kelly, Rochelle Owens, George Economou, Laurie Duggan, Mark Weiss, David Miller, Simon Marsh, Michael Rothenberg, Burt Kimmelman, Jesse Glass, Joe Milazzo, Norman Weinstein, Pierre Joris, and Gregg Biglieri. Also includes response pieces by Éric Athenot, Ian Brinton, Mike Heppner, and Keith Jebb. Posted on March 10, 2019 by goldenhandcuffs. 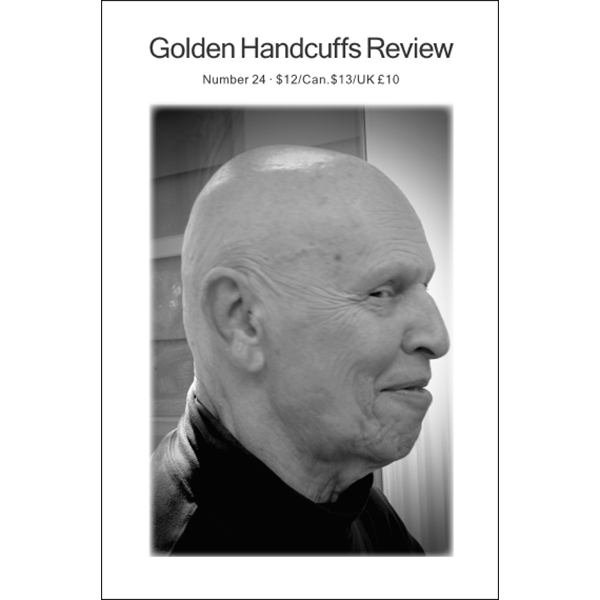 NEW Golden Handcuffs Review #26 collectible print edition from 2019! This issue features cover art by Andrea Augé. Poetry and prose by Lori Baker, Joanna Ruocco, Marream Krollos, Richard Makin, Alice Notley, Denise Riley, Robert Kelly, Rochelle Owens, George Economou, Laurie Duggan, Mark Weiss, David Miller, Simon Marsh, Michael Rothenberg, Burt Kimmelman, Jesse Glass, Joe Milazzo, Norman Weinstein, Pierre Joris, and Gregg Biglieri. Also includes response pieces by Éric Athenot, Ian Brinton, Mike Heppner, and Keith Jebb. Posted on December 30, 2018 by goldenhandcuffs. 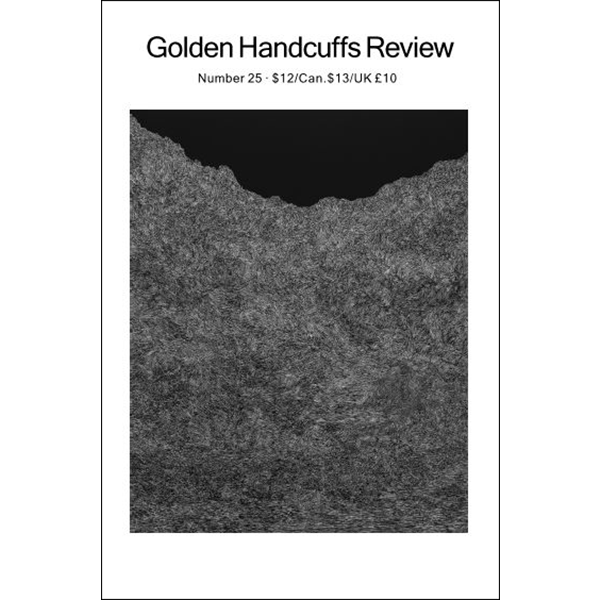 Golden Handcuffs Review #25 interactive .pdf download edition from 2018! This issue features cover art by Mary Ann Peters. Poetry and prose by Stacey Levine, Rae Armantrout, Rosmarie Waldrop, Nancy Gaffield, Anne Tardos, Leslie Kaplan, Roberta Olson, Lisa Samuels, Meredith Quartermain, Joanna Ruocco, Catherine Walsh, Susan M. Schultz, Geraldine Monk & Alan Halsey, Marthe Reed, Sarah Mangold, and Jeanne Heuving. Also features response pieces by John Olson, Jeanne Heuving, and Amy L. Friedman. Posted on August 21, 2018 by goldenhandcuffs. NEW Golden Handcuffs Review #24 .pdf e-book download. This issue features a cover photograph of David Antin by Andrea Auge. Included are pieces honoring David Antin by Jerome Rothenberg, Rachel Blau DuPlessis, Hank Lazer, Helene Aji, and Stephen Fredman. Poetry and prose by Alice Notley, David Bromige, Maurice Scully, Ken Bolton, Keith Jebb, Scott Thurston, Donald Wellman, Michael Rothenberg, Joseph McElroy, Lance Olsen, Ben Slotky, Ken Edwards, and Peter Quartermain. Translation and transformation by David Vichnar. Response and reviews by Ken Edwards, Nerys Williams, and Ian Brinton. Posted on April 18, 2018 by goldenhandcuffs. NEW GHR Publications anthology .pdf e-book edition from 2017! Bless thee, Bottom, bless thee! 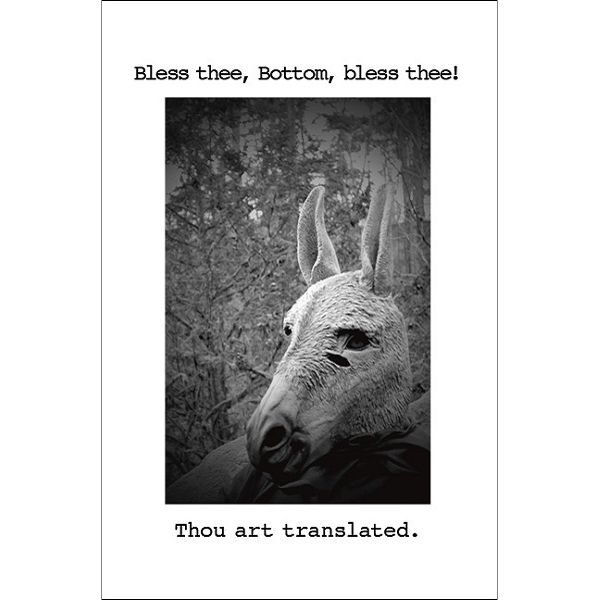 Thou art translated. Translations and Transformations features a cover photograph by Andrea Auge. Poetry and prose by Peter Hughes, Toby Olson, George Economou, Hank Lazer, Joe Ashby Porter, Paul Pines, Jesse Glass, Alec Finlay, Ariel Resnikoff, and Robert Mittenthal. Translations and commentary by Ian Brinton, Norman Weinstein, Jeffrey Twitchell-Waas, Robert Arellano, and Antoine Caze. Posted on August 16, 2017 by goldenhandcuffs. GHR Publications anthology collectible print edition from 2017. Bless thee, Bottom, bless thee! Thou art translated. Translations and Transformations features a cover photograph by Andrea Auge. Poetry and prose by Peter Hughes, Toby Olson, George Economou, Hank Lazer, Joe Ashby Porter, Paul Pines, Jesse Glass, Alec Finlay, Ariel Resnikoff, and Robert Mittenthal. Translations and commentary by Ian Brinton, Norman Weinstein, Jeffrey Twitchell-Waas, Robert Arellano, and Antoine Caze. Posted on May 11, 2017 by goldenhandcuffs. a screw in the shoe: Anthology of Challenges .pdf e-book features a cover photograph by Eleanor Antin. Poetry and prose by Carol Watts, Andrea Brady, Maurice Scully, John James, Sarah Hayden, Norman Weinstein, Nancy Gaffield, Stuart Cooke, Norman Fischer, Rachel Blau DuPlessis, Nathaniel Mackey, Richard Makin, Toby Olson, Michael Upchurch, Philip Terry, James Davies, John Hall, Peter Hughes, Peter Quartermain, Richard Makin. Publishing piece by Ken Edwards and reviews by Norman Weinstein and Steve Potter. Posted on November 14, 2016 by goldenhandcuffs. GHR Publications anthology collectible print edition from 2016! 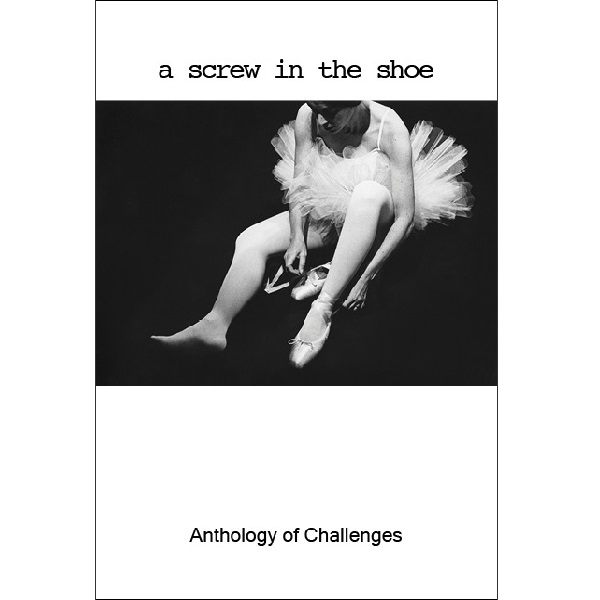 a screw in the shoe: Anthology of Challenges features a cover photograph by Eleanor Antin. Poetry and prose by Carol Watts, Andrea Brady, Maurice Scully, John James, Sarah Hayden, Norman Weinstein, Nancy Gaffield, Stuart Cooke, Norman Fischer, Rachel Blau DuPlessis, Nathaniel Mackey, Richard Makin, Toby Olson, Michael Upchurch, Philip Terry, James Davies, John Hall, Peter Hughes, Peter Quartermain, Richard Makin. Publishing piece by Ken Edwards and reviews by Norman Weinstein and Steve Potter. Posted on September 28, 2016 by goldenhandcuffs.